Ever lost track of time just wandering around Wikipedia? It’s late at night (or in a long meeting you have nothing to do with) and you look up an item on wikipedia, which has a link to something else and then another link… it can go on for more hours than we care to admit to. A good limiter used to be how long you could sit at your desk or your notebook battery only lasted a couple hours. Now, Wikipanion loaded on your iPad, the fun can take you all the way to the next day. “Sleep is so over rated”. Kidding aside, bouncing around wikipedia on your iPad can be very educational. If you search for a topic you have a question about at work or home, an app like Wikipanion will get you a quick answer. Tapping on the links within the article may take you down a road you would not have imagined. The linked article leading to another to another shows how many things are linked together. Generally, you will end up on a page you would have never searched for. It is like the early days of bouncing around Web sites used to be. Today we were introduced to a new app for finding information, not so much for information sake but more for instructions. Equally interesting to just look around to see where links take you, the eHow app for iPad gives back lessons on how you can do things. 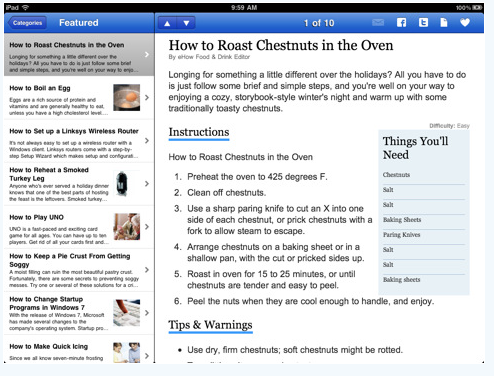 This free, universal app, delivers to your iPad access to all of the ‘How To’ guides that has made eHow famous. 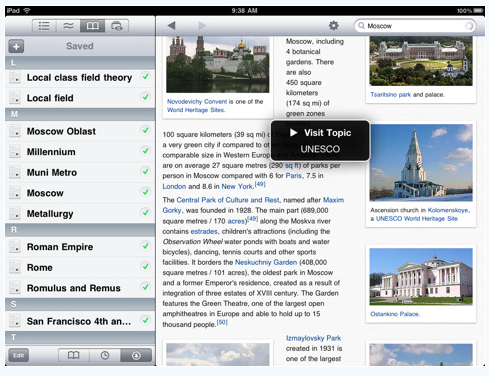 Using eHow for the iPad is made easy mostly because of the landscape layout of the information. Access to the categories are done via the left bar (much like Wikipanion for Wikipedia) so your content stays viewable as you look for additional information. Since every great learning tip must be shared, we are enjoying having the Twitter and Facebook buttons always available in the upper right corner of the screen. The eHow for iPad app introduces a whole new endless journey of jumping from ‘How to’ lesson to another. We went to find out if there was anything special about waxing a car and ended up learning a few sking tips that might help us not break a leg. Of course, a broken leg would mean more time in the chair to get lost in wikipedia…. or learn how to program our AppleTV.